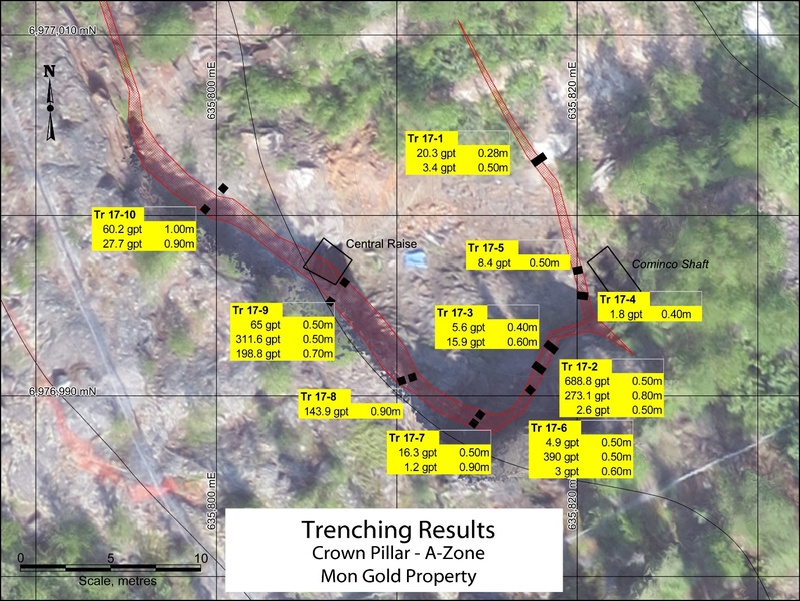 Vancouver, British Columbia--(Newsfile Corp. - August 7, 2018) - Sixty North Gold Mining Ltd. (CSE: SXTY) (FSE: 2F4) (OTCQB: SXNTF) (the "Company" or "Sixty North Gold") is pleased to announce that it has received the results of a confirmation mechanized trenching program of the crown pillar of the A-Zone at the Mon Gold Property. Field blanks and standards, repeat assays and laboratory standards all reported acceptable results. Ron Handford, President and CEO reports, "We acquired our interest in the Mon Property because of its high-grade nature and similarities to the past producing Discovery Mine which is located 45 km north of us. The results collected by our director with specific geological knowledge in this belt confirms our beliefs and reveals some exceptionally-high grade results, similar to anecdotal descriptions from individuals who had previously mined the property. It is our belief that the historical drill holes from beneath the previously mined areas together with descriptions from what was mined provides further support that the mineralization extends below previous workings at shallow depths, less than 10 m below the portal elevations. This represents an exciting exploration opportunity that can be assessed easily by bulk sampling." The A-Zone is a high-grade gold-bearing quartz vein deposit that was discovered by Cominco in 1937. They sank a shaft and completed minor underground development in 1938. It has been held continuously since then, explored by different groups and was mined by private interests between 1990 and 1997 with limited records of production and grade. It was milled on site and tailings remain on the property. Three principal gold deposits occur in the Yellowknife Gold Belt, including 1) Very large tonnage low-grade disseminated gold deposits (Ormsby-type), 2) Large tonnage high-grade shear-zone hosted gold deposits (Giant Mine-type) and 3) Very high-grade stratabound non-stratiform gold deposits "SBNSF" (Discovery Mine-type). The A-Zone appears to have many geological characteristics similar to the latter, Discovery Mine-type of gold deposit. Average trace elements are low for Mo (0.52 ppm), Cu (296 ppm), Ni (32 ppm), Co (17 ppm), As (174 ppm), U (0.31 ppm), Th (1.04 ppm), Sr (9.8 ppm), Cd (16.0 ppm), Sb (0.7 ppm), Bi (9.5 ppm), B (3.5 ppm), W (2.8 ppm), Tl (0.1 ppm), S (1.4 %), Hg (98 ppb), Se (4 ppm), Te (7.1 ppm) with the only other materially elevated elements being Pb (2,151 ppm), Zn (2,450 ppm), and Ag (19.21 gpt). All samples were collected using an electric percussion hammer and were located by tape and compass, bagged and tagged with certified blanks and standards inserted at 1 in 7 to 1 in 10 intervals, sealed, delivered to Bureau Veritas Laboratories in Yellowknife and processed at their ISO/IEC 17025:2005 and ISO 9001:2015 certified laboratory in Vancouver. Bureau Veritas is independent of the Company. All samples were crushed and pulverized using PRP 70-250, analysed for 53 elements by ICP-MS using AQ251 and fire assay gold FAA 330 with all over limit golds analysed using fire assay gold FAA 550. The laboratory also runs duplicate and repeat analyses of every 15 to 25th sample, as well as internal blanks and standards which are reported to the Company. Mr. Brian Malahoff, B.Sc., P.Geo. is the Qualified Person for this release within the meaning of NI 43-101 and has reviewed the technical content of this release and has approved its content.